Austin is located on Highway 50 (also known as the loneliest highway in America), more or less smack-dab in the middle of the state, give or take a bit. The nearest town of any size to Austin is a very far away. 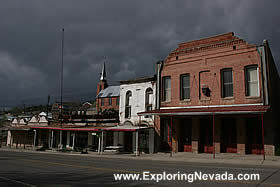 Thus if you love isolation, Austin, Nevada is the place to visit. Yet, there are many reasons to visit Austin. The location of Austin is ideal for outdoor recreation. Numerous mountain ranges surround Austin and provide excellent places to go hike, camp, mountain bike or to simply explore using the many four-wheel drive roads. 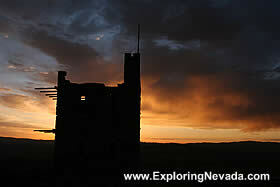 Austin also serves as a great jumping off place to explore several beautiful Nevada scenic drives. The Big Smoky Valley Scenic Drive begins about twenty miles to the east, while the Reese River Valley Scenic Drive and the Desatoya Mountains Scenic Drive begin right outside of town. The town of Austin is very historic. Many old and historic buildings are located in town, as is the remnants of Stokes Castle. Stokes Castle is a very old building that was constructed in 1897 by Anson Phelps. The castle was built using native granite. Stokes Castle was originally meant to be a summer home, but in 1898, soon after the castle was completed, Anson Phelps sold his nearby mine and equipment and left town, never visiting the castle again. Austin also sits in a very beautiful location. The sprawling and massive Big Smoky Valley sits to the southeast, the Toiyabe Mountains to the south and the equally beautiful Reese River Valley to the southwest. Because Austin sits near these beautiful places, more than a few wayward travelers view Austin as not a tiny town in the middle of nowhere but instead as a very much needed link to civilizationton, since Austin is the only place around to buy gas or other supplies. Due to Austin’s location on Highway 50, and the fair amount of traffic that whizzes through town, Austin has two motels. None of the motels are chain motels. Instead, they are locally owned and operated. As such, you can’t book online for these hotels. Use the online yellow pages to find the names of these hotels and call instead. There is one decent restaurant in town, called the Toiyabe Cafe, and it gets a fair amount of business due to, quite simply, the complete lack of anyplace else to eat between Fallon and Eureka! There are a few, small, locally owned motels in town. However, they aren't available for online booking.